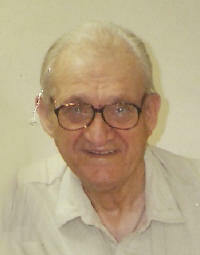 Oliver L. “Ollie” Luber, 88, of Highland, died Sunday, February 24, 2008 at St. Joseph Hospital in Highland. He was born June 24, 1919 in Highland to Louis S. and Olivia (Weidner) Luber; they preceded him in death. He married Mary Holtgrave on December 27, 1944 at St. Rose Catholic Church; she preceded him in death on April 30, 1997. Also preceded in death by sisters, Katherine Koelz and Gladys Windsor, and brothers, Howard Luber and Ralph Luber. Surviving is a brother, Leon (Imogene) Luber of Highland. A brother-in-law, Clarence Windsor of St. Peters, MO and sisters-in-law, Gaye Luber of San Antonio, TX and Alberta Homann of Glen Carbon. Ollie formerly worked as an assistant supervisor inspector for the United States Department of Agriculture and he retired as a farmer. He was a member of St. Paul Catholic Church in Highland and a former member of St. Rose Catholic Church and Men’s Sodality, Knights of Columbus Council 1580 in Highland, and 4th Degree Highland Assembly 0231, Charter member of Highland VFW Post 5694, Highland American Legion Post 439, and the St. Rose Development Club. He was an Army Veteran of WWII. Funeral Mass of Christian Burial will be Wednesday, February 27, 2008 at 2:00 PM at St. Rose Church with Fr. Edward Schaefer officiating. Interment will be in St. Rose Cemetery at a later date. Visitation will be Tuesday, February 26, 2008 from 4:00-8:00 PM and again on Wednesday, February 27, 2008 from 11:00 AM-1:30 PM at the Moss Funeral Home in Breese. The Highland American Legion will hold services at 6:00 PM, the Highland VFW at 6:30 PM, and the Highland Knights of Columbus and 4th Degree will hold services at 7:00 PM all Tuesday evening at the funeral home. Memorials can be made to St. Rose Church or Holy Cross Missions and will be received at the funeral home.